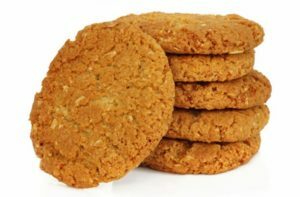 An Anzac biscuit is a sweet biscuit, popular in Australia and New Zealand, made using rolled oats, flour, sugar, butter (or margarine), golden syrup, baking soda, boiling water, and (optionally) desiccated coconut. Anzac biscuits have long been associated with the Australian and New Zealand Army Corps (ANZAC) established in World War I.
Let’s know about it’s ingredients. It has been claimed the biscuits were sent by wives to soldiers abroad because the ingredients do not spoil easily and the biscuits kept well during naval transportation. 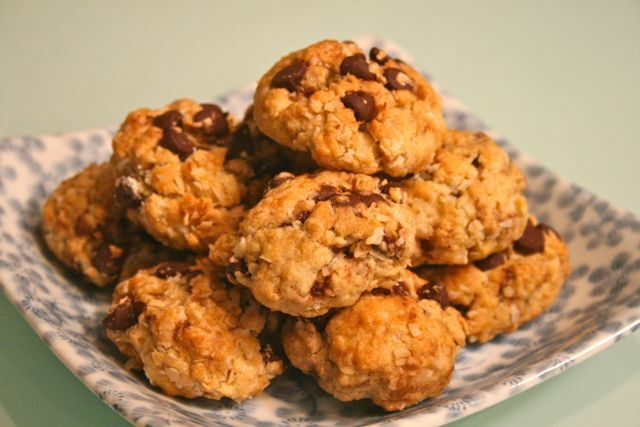 Today, Anzac biscuits are manufactured commercially for retail sale. Let’s know how much or which ingredients you will need. Step One : First of all you need to Preheat oven to 170C. Place the flour, sugar, oats and coconut in a large bowl and stir to combine. Step Two : Place the golden syrup in a small saucepan and butter and stir over low heat until the butter has fully melted. After that you will need to mix the bicarb soda with 1 1/2 tablespoons water and add to the golden syrup mixture. Remove from the heat cause it will bubble whilst you are stirring together. Step Three : Pour into the dry ingredients and until fully combined mix together. Roll tablespoonfuls of mixture into balls and place on baking trays lined with non stick baking paper, to flatten slightly, pressing down on the tops. Step Four : Bake for 15 minutes or until light golden. Enjoy the Anzac Biscuits with your loving friends and family. Thank you.